Monk parakeets caw on the 106-foot spires of the Gothic-style arch at the entrance of Green-Wood Cemetery in Brooklyn, New York. Purple-grey clouds settle atop weather-worn brownstone mausoleums. One may mistake it for the opening of a Stephen King novel. But Green-Wood’s full-time historian, Jeff Richman, spends a lot of time trying to convince people that cemeteries are nothing to be afraid of. 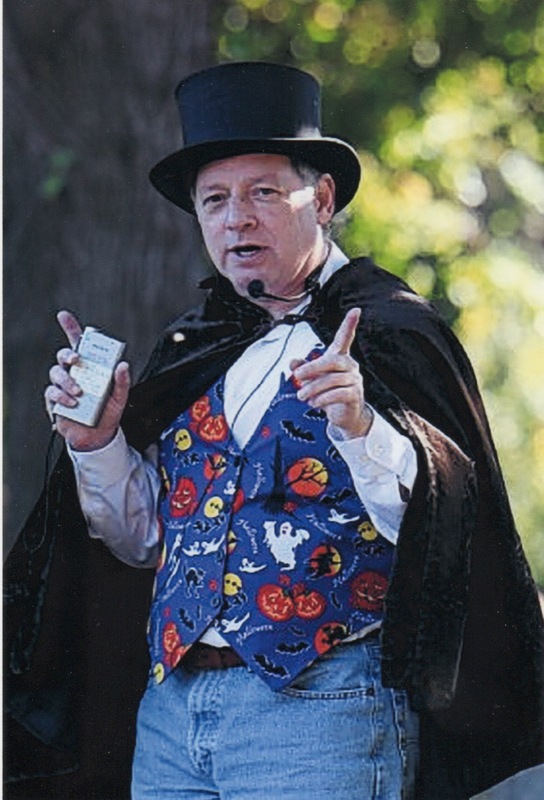 Among other responsibilities, he organizes year-round tours across the cemetery’s 478 acres, the most popular of which are the “murder and mayhem” Halloween tours. For those, Richman dons a top hat and kitschy pumpkin-embroidered purple vest. Years in the business: In 1990, I started giving tours of Green-Wood and researching to write a book about the cemetery. I realized there was a ton of misinformation and incomplete information, and I wanted to clear that up. In 2000, I became a part-time historian here, and went full-time five years ago. What initially brought you to Green-Wood? When I was young, I collected stereoscopic views, which are images placed in a stereoscope to create a 3D effect. I kept coming across images of Green-Wood from the 1860s and 1870s, so when I saw an ad in the newspaper for a photography tour of Green-Wood, I wanted to see whether it had changed in 130 years. Did you have an “aha” moment during that tour? As I walked through Green-Wood, it occurred to me: This was a landscape in the middle of urban Brooklyn that had remained unchanged for over a century. I immediately knew it was the place for me, so I returned again and again, and soon started leading tours while practicing law part-time. Responsibilities as historian: It’s pretty varied. I lead weekly tours, blog for Green-Wood.com, and pick out plants for the gardens. I’m involved with curating exhibitions, writing books, and collecting things pertaining to the cemetery itself or the people buried here. I also work with our cutting-edge restoration team. Using an old photograph, we identified the broken remains of a monument in the cemetery, and then helped restore it. Is Halloween your busiest time of year? Yes. This year, we had 450 visitors for our Halloween tours, which tend to draw a lot of first-timers. Your Halloween tour attire: It’s been the same for years: black top hat, cape, Halloween vest, and jeans. I also use props, like a walking hand, spiders, and George Washington’s chattering teeth. I try to entertain the visitors to the extent that I can. Yearly visitors: Between 200,000 and 300,000. Our trolley allows us to do themed tours throughout the year, like the Women of Green-Wood and the Pioneers in Baseball of Green-Wood tours. 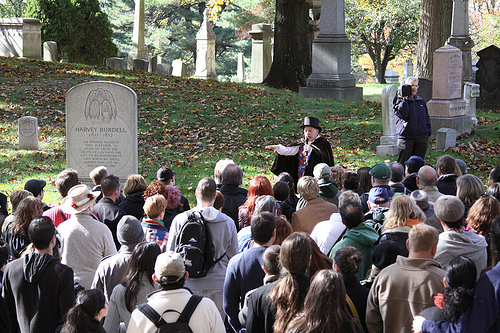 We also host a number of book talks followed by custom-prepared trolley tours throughout the cemetery. Most famous permanent residents: Horace Greeley [founder and editor of the New York Tribune], William Magear (“Boss”) Tweed, and Leonard Bernstein. We also have Wyckoff Van der hoef, who died at sea on the Titanic, and more than 100 people from the Brooklyn Theater Fire of 1876. Is the cemetery running out of space? It’s 478 acres, but yes, we are running out of space for new graves. In 5 to 10 years, I think we’ll be filled up. Cemeteries often get a bad rap, not in any small part thanks to scary movies. We spend a lot of time trying to convince people there’s nothing to be afraid of in cemeteries. We held a movie series in our chapel a few years ago to bring in children, in the hopes that they would no longer consider cemeteries a place to stay away from, but instead a great space to learn in. Do you still show kids’ movies there? We had one vociferous complainer, so we ended that series. But we often bring in classrooms, and we’re pivoting to become a community-oriented historic park, an alternative to Central Park and Prospect Park. Number of bodies interred at Green-Wood: More than half a million. Okay, so you’re not scared of dead bodies. What does creep you out? Leading bus tours. Are you superstitious? Not exactly. But I do believe that there are more than just, you know, coincidences. Sometimes, it’s like certain graves are calling to us: You never noticed me before, but I’m right over here, come take a look. Best part of your job: The people. I’m currently writing a book for the cemetery’s 175th anniversary, for which I’m collaborating with curators, Pulitzer Prize winners, and other experts in their fields. Most challenging part of your job: Keeping track of everything that needs to get done. But that’s a good problem to have. What would people be surprised to learn about you? I’ve always been a collector — baseball cards, duck decoys, nineteenth century primitive tools, photographic paperweights, and architectural details. And I already mentioned stereoscopic views. If you had one hour of free time, where would you spend it? I love Acadia National Park in Maine, and the American Wing at the Met[ropolitan Museum of Art]. But Green-Wood, with all its levels of interest and discovery, is my favorite place. Your favorite spots at Green-Wood: The spectacular marble carving of Jane Griffith, the Beard Bear, the Civil War Soldiers’ Lot, and Niblo Mausoleum on Crescent Water. Oh, and the hill above Valley Water where the Tiffanys are interred and my gravestone stands. 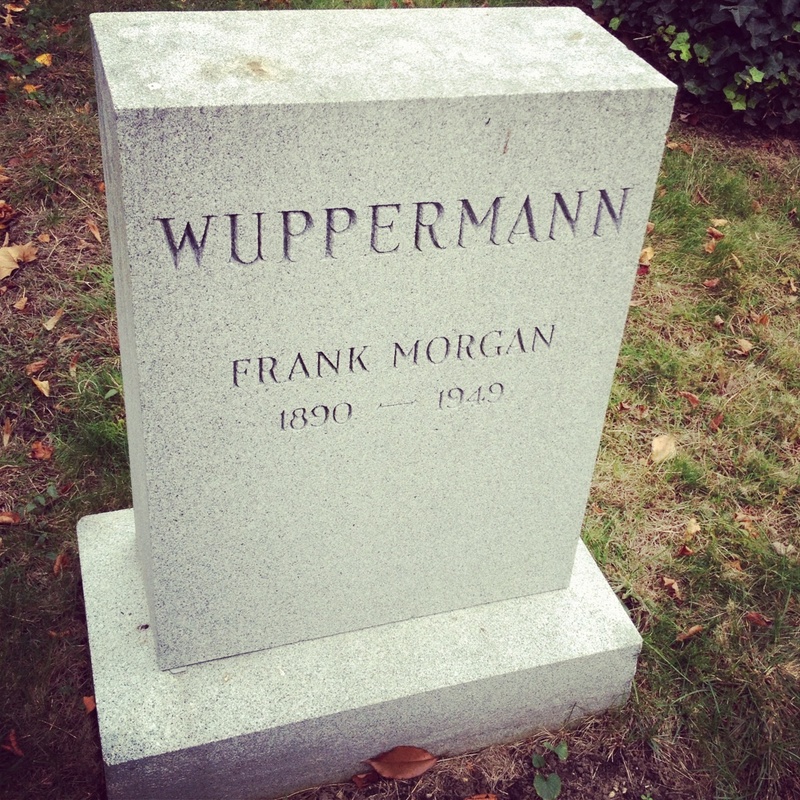 The tombstone of Frank Morgan, the title character in the The Wizard of Oz. Spoiler alert: this was not built with emeralds or yellow brick. Are you dressing up for Halloween this year? No. After the tours, I’m pretty much done with Halloween. But I’ll still give out candy to the neighborhood children. Do you plan to be buried at Green-Wood? Yes, I have a grave there. There is value in having a place where your loved ones can pay their respects. Create a position on your own if you see a need for it. Approach the people who have funding and explain what you can do for them. In 174 years, Green-Wood has had only one other historian, and he died more than 100 years ago. Fortunately, I was able to come in and offer something helpful to our society. Meet another No Joe Schmos bringing history to life: the guy who makes treasures from recycled waste at TerraCycle. 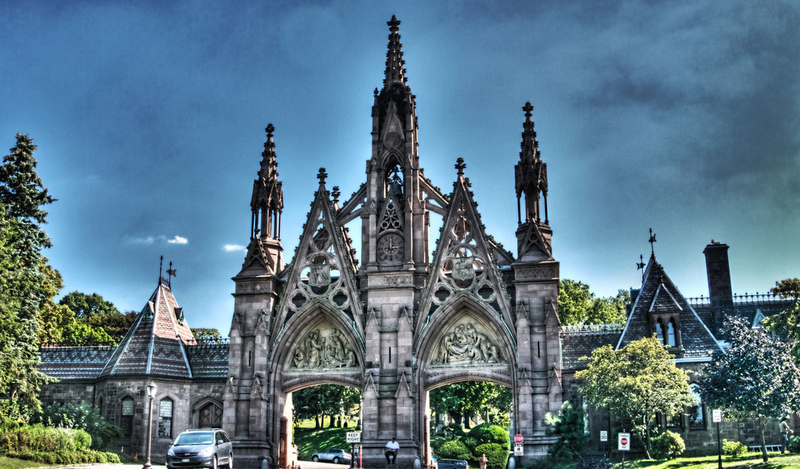 This entry was posted in Cool jobs, Crazy jobs and tagged cemetery tours, greenwood cemetery, halloween tours, jeff richman, new york cemeteries by Megan Hess. Bookmark the permalink.